One of my earliest memories as a toddler is crawling on the floor beneath the grand piano in our home. I recall lying on my back peering up at the piano’s undercarriage with its unvarnished hardwood and brass fittings. A mystery to me then, it served as a good early childhood hideout. 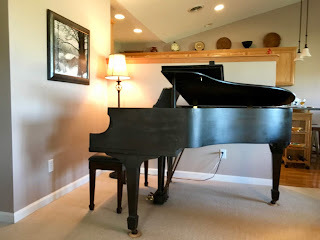 Growing up in those years — the 1940s — I innocently thought every home had a grand piano, as much a part of the household as a stove or refrigerator. Of course that wasn’t the case. Many people had uprights, but I knew of no other grands in the neighborhood. We had one because my mother was an accomplished pianist, and, aside from practicing her music and rehearsing with various wedding singers, she gave lessons to up-and-coming hoped-for future pianists in western Duluth. I have had that piano in my own homes for the past 35 years — since the death of my mother. I can’t play it beyond the ditties anyone growing up with a piano learns in childhood, such as “Chopsticks.” My own piano lessons didn’t take. But I couldn’t bring myself to part with it. Now it is moving on. In light of that I thought I’d track the history of that “baby” grand since it became a part of our family, long before even I was a baby myself. My mother bought it from the former Boston Piano Co. in Duluth on Feb 27, 1930, for $685. Amazingly, the contract for it survived in the family archives. 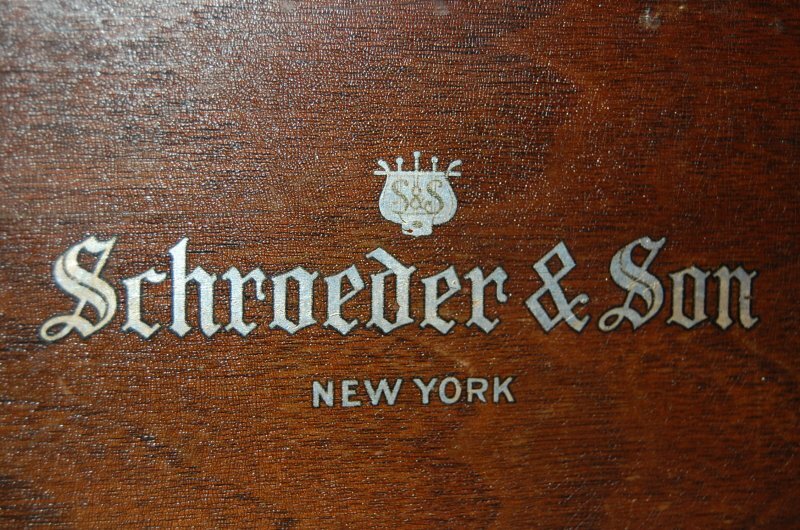 It is a Schroeder & Son piano. That manufacturer went out of business during the Great Depression, Google informs us. Its first stop was in lower Piedmont Avenue, where my mother, still single, resided. After she married in 1932, it was moved to a duplex apartment on West Sixth Street in Duluth’s West End where she and my father lived and started their family. There it remained until shortly before I was born in 1939, when my parents, and my older brother, moved to a home they purchased a short distance away on north 23rd Avenue West. The piano came with them, of course. A home with ample space, the piano was placed in a sizable entrance room off the living room. It was there that I discovered it as a toddler and where it remained throughout my childhood, youth and young adulthood until her death 44 years later. Time to move it to a fourth location. By then I had married and had a family of my own (and an upright piano of our own for our two kids to learn on) living in the Lakeside neighborhood. Somehow, the movers (never move a piano without professional movers) managed to wedge it down our basement stairway into a rec room, making us a two piano family. About seven years later, we moved, and the professionals had to take it apart — separating the harp and the case — to get it back up the stairs. We told them to take it to their shop, on Superior Street in Downtown Duluth, and recondition it before moving it to our new residence. That shop would be the fifth location in Duluth for that piano, even if it was temporary. And we sold our upright. Once settled in our new home in Hunters Park, the baby grand was delivered to us, splendidly reconditioned, even with new gleaming white keys. It originally had ivory keys that had become chipped and worn. Modern piano keys are no longer ivory, but they look the same. It was the sixth location for the now 60-year-old instrument. It fit nicely into our large living room in that home for the next 15 years, after which it came with us to our current dwelling, a townhome in Hermantown, serving as its seventh location, or eighth if you count the several months in storage while our current home was being built. Here it fills a living room corner, designed to accommodate it, where our grandchildren have amused themselves plunking on its keys, and even, as they have grown older and endured lessons, playing it. Now, we are preparing to move it one more time as it passes to still another generation of our family. It will repose next in Duluth’s Congdon neighborhood at the home of our son — grandson of the original owner — and his family in a household including some of her great-grandchildren. It will be the ninth move for the piano within a radius of no more than about five miles over a period of almost 90 years and a lot of Duluth history. Well, 88 years to be precise, the same number as there are keys on a standard piano. We’re happy to pass it on and to keep it in the family, with future generations perhaps finding a place for it in their homes. I’m looking forward to playing “Chopsticks” again when we visit.